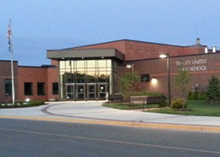 Le Center is part of the Tri-City United School District (#2905), which serves the cities and surrounding areas of Le Center, Montgomery and Lonsdale, Minnesota. Students enrolled in Kindergarten to 8th Grade attend the TCU Le Center Elementary-Middle School located at 150 Tyrone Street W in Le Center. Students enrolled in grades 9 thru 12 attend at the TCU High School located in Montgomery. All administrative and student related issues should be directed to the school district and to the respective schools.